And there is an “unidentified” device partly demonstrated, but an expert eye will definitely encrypt that it is an iPad! If you’re attentive enough, you've probably mentioned that there is no home button, at least not where it should be. Some say that the device on the pic is rotated the way that the part shown is the side, not the bottom, based on the water drops on the device screen. The water drops unveils one more secret as well: the next gen iPad will be completely waterproof, as it seems. Anyway, as for the home button, if there is one, what should we touch then? I mean something that is disclosed, and we have never touched it before. Anyway, there is a great possibility that the almost trademarked home button will not be present on iPad 3, and there is no word on what will be placed instead. One more thing – ( © Steve Jobs )– is the extremely high quality display demonstrated on the device at the pic. To be fair, iPad 2 display lays far behind from what is shown here… So it is reasonable to expect iPad 3 to feature 2048 x 1536 resolution display! Now look at the icons on the screen – all we can clear our is the maps and calendar. The later shows the event date – March 7, Wednesday (Apple’s lovely magic day) as expected. As for the maps, it’s very likely that Apple will introduce own maps instead of the Google maps it has used till now. However, all we have to do is to keep calm and wait a bit ( one week is such a little time compared to how much we’ve been waiting for iPad 3 so far) and see what Apple has to show off on March 7 in San Francisco. 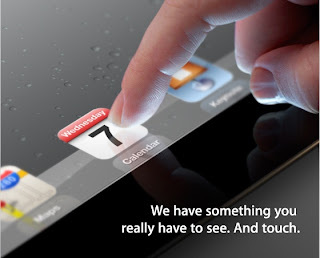 Stay tuned to be the first to learn about iPad 3!